Sri Lanka has a long tradition as a home to four world religions plus the ethnic religion of indiginous Veddha tribes. Buddhism, as the religion of the Sinhalese majority, has shaped the island's history and culture more than any other faith. 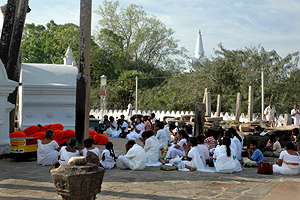 Sri Lanka became the refuge of the Theravada school, the oldest version of Buddhism, and influenced Buddhism in Southeast Asia significantly. This is why the island's sacred places have attracted Burmese, Thai and Khmer Buddhists for one millennium. Since the late 19th century, Buddhists from Japan and other primarily Mahayanist countries also intensified their ties with Sri Lanka. Though Buddhism is predominant, the charisma of the mystical island known as "Lanka" for Hindu pilgrims cannot be underestimated. 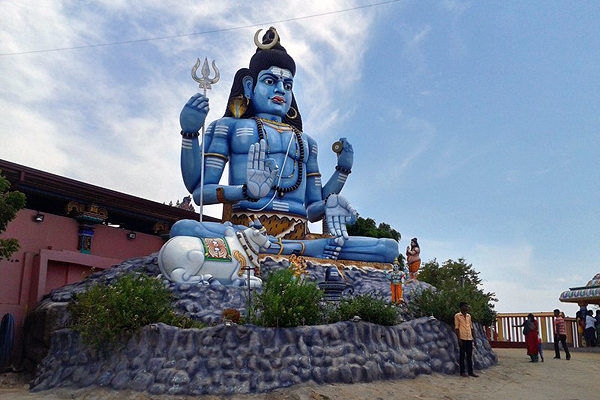 Tamil places of Shiva worship in Sri Lanka are highly respected by Southindians, too. And venues of Ramayana episodes are popular with Hindus from all over India and the world. 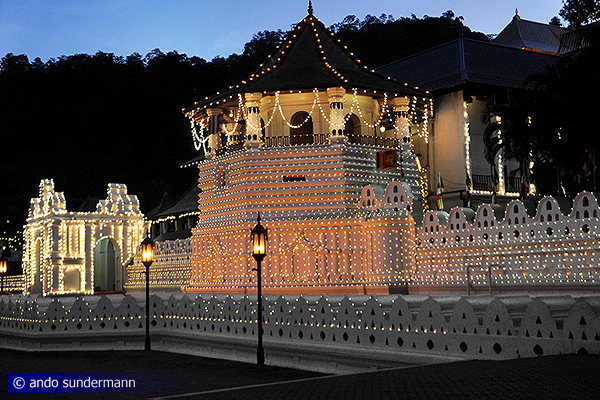 Sri Lanka's major Buddhist place of pilgrimage is the Dalada Maligawa in Kandy. It enshrines an eyetooth of the Buddha, which remained undestroyed when the Buddha was cremated. The sacred tooth is regarded as the most reverend relic not only by Sri Lankan Buddhists. Similarly, the significance of the Anuradhapura Bo-Tree for Buddhist devotees cannot be overestimated. It's the oldest surviving part of the original tree of enlightenment, since the the Bodhi-tree at the scene of the enlightenment, in Bodhgaya in India, has been destroyed by Muslim invaders. There is one very interesting characteristic of all major Buddhist pilgrimage sites in Sri Lanka - Tooth Temple, Bo Tree, Siri Pada, Kataragama - that is notable: All of them are not exclusively Buddhist, all of them are Hindu places of pilgrimage, too. 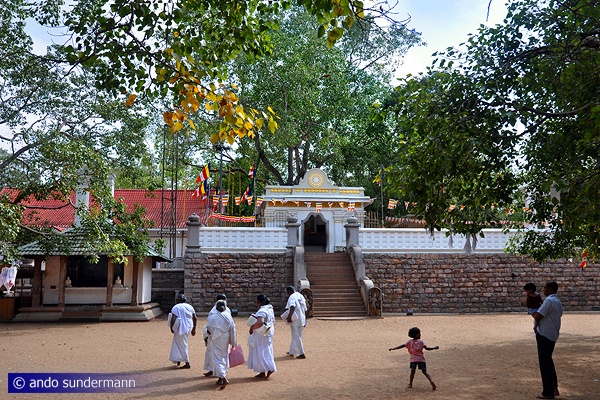 Siri Pada and Kataragama are also held in high veneration by the island's traditional Muslim community. The Sacred Tooth Relic Temple in Kandy is surrounded by shrines for Hindu deities protecting the relic and the Sinhalese religion. The Bo-tree is connected to Shiva and Vishnu worship, too. Hindus believe, that the footprint on the summit of the Siri Pada mountain (Adam's Peak) was left by Lord Shiva, whereas Muslims regard it as a footprint of Adam, who was the very first prophet of their religion. In Kataragama, Hindu and Veddha shrines and a Muslim mosque and a Buddhit dagaba are standing side by side and in close connection to each other, the Kataragama festival is attended by devotees of all pre-colonial religions of the island. This intimate relation was disturbed only during the British colonial period, when priests of different religions startet to compete in claiming primacies and superiorities. Despite regrettable incidents of rivalry, sometimes becoming violent in the recent century, the four holiest places in Sri Lanka remain to be "shared" by Buddhists and Hindus till the present day. You can see this symbolised at the Kandy Perahera, the pageant honouring the Buddhist Tooth Relic. The festival season is opened at a Vishnu shrine, and the priests of four Hindu deities are following the Tooth Relic in the same pageant. The priests of the Kataragama temple, the elephant of which is easily recognizable due to its red colour, are Tamil Brahmins. Ceremonies at Buddhist and Hindu temples are called "pujas", and they have many characteristics in common. Sri Lanka's most important places of pilgrimage for Muslims and Christians are Dewatagaha Mosque in Beruwela and Madhu Church near Mannar respectively. In contrast to the above-mentioned sacred sites of Buddhism and Hinduism (and in some cases of Islam, too), Sri Lanka's churches and mosques are not of international importance, but attracting ten thousands of Sri Lankan citizens during their respective festival seasons. It is a common practice in Sri Lanka that neighbours of various religions take part in festivals of other communities or congratulate celebrating friends of different faiths. Sinhalese and Tamils in particular celebrate the same New Year festival. Three Muslim and two Christian feast days are national holidays in Sri Lanka. Kandy's Sacred Tooth Relic Temple (Dalada Maligawa) enshrines the upper canine tooth of Buddha. This precious relic sheltered in a casket can never be seen by ordinary people. The three daily pujas are celebrated in front of the shrine room in the upper floor. The Holy Tooth was smuggled from Kalinga to Sri Lanka in 313 C.E., hidden in the Princess Hemamali's hair knot, to safe it from fanatic vandalism. From then on, the city keeping the Tooth Relic was considered to be the capital of the cisland. After the Portuguese tried to destroy it, the Sacred Tooth was moved to Kandy. A first Tooth Temple was built here around 1700. Today's front buildings, e.g. the library octogon, are from the 18th century. The interiors of the temple are richly decorated with woodcarvings, inlaid works, lacquer, and ivory. During the Esala Perahera festival celebrations, the entire front is lightened up. When asked to send a nun to establish a female ordination line in Sri Lanka, India's Emperor Ashoka in the 3rd century B.C.E. sent his own daughter, Sanghamitha, with companions who also brought a sapling of the original tree of enlightenment from India, the Sri Mahabodhi. The tree was welcomed by Sri Lanka's King Devanampiya Tissa himself at the shores of the island. The procession of the Bo-Tree's transfer t Anuradhapura is narrated in the chronicles in much detail. From this sapling grew a full tree, which today is the oldest surviving tree of which records mention the date of is planting. The tree is well maintained, as to popular belief, Sri Lanka will thrive as long as the Bo-Tree thrives, too. The Sacred Bo-Tree is visited by many pilgrims, asking for fertility or recovery from sickness. Watering the Bo-Tree seven times while circumambulating it seven times is a meritorious deed. The perfect conical shape of Siri Pada made it the island's landmark peak for seafarers from east and west, a legendary mountain on a tropical island full of riches. For examples the Tales of 1001 nights mention Siri Pada in the seventh journey of Sindbad as containing many kinds of rubies and spice trees. Another reason for its mythical reputation is that four rivers run from here to all for directions, what is told in myths of several cultures about the central mountain of the universe or of the paradise. The depression on the uppermost rock of the mountain shows the form of a giant footprint. Buddhists believe it was left by the Buddha, Hindus ascribe it to Shiva, Muslims to Adam and Christians to St. Thomas. 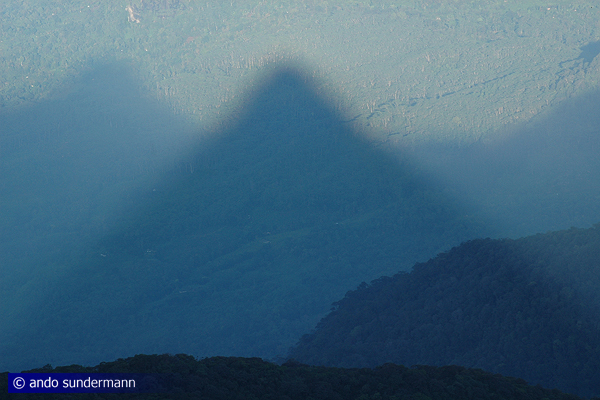 Pilgrims climb to the top during the night to be able to welcome the first rays of the sun on the top and then admire the triangular shadow of the peak as a good omen. 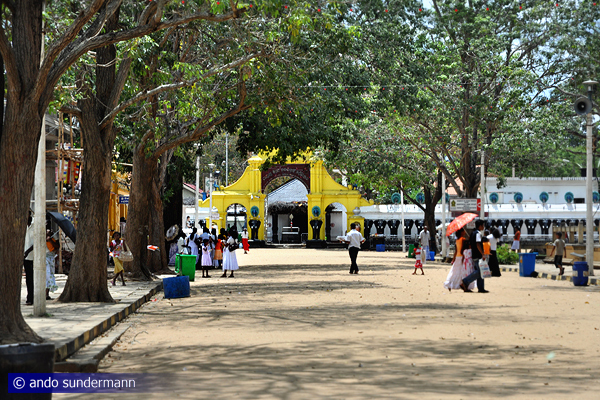 Kataragama is the most important pilgrimage site in southern Sri Lanka, holy for Buddhists, Hindus, Muslims and Weddas. 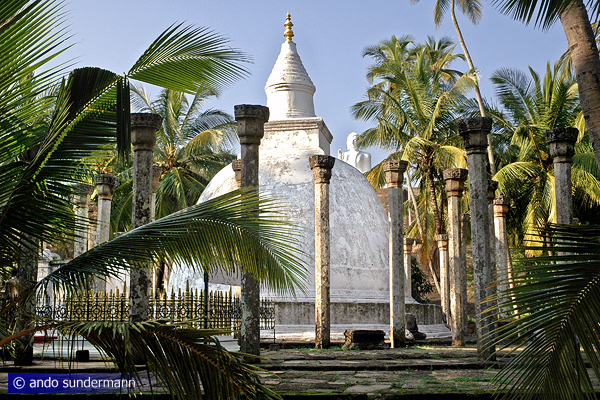 The main shrine is dedicated to Lord Kataragama, who is identified with the Tamil Murugan and the Brahmanic Skanda. Near the temple the Buddhist Kiri Vehera stupa at a Buddha-visited place. A mosque is even closer to the main Hindu shrine. Historians believe that Kataragama was originally a place of worship of Veddha tribes, later on adopted by other religius groups. The Wedda origin is indicated by the absence of an idol. The main symbol is an aniconic Yantra. Its exact form is kept a secret. Other ancient Wedda places of worship don’t use statues as cultic images, either. The foundation legends also connects the site to Weddas. Lord Kataragama, coming from India, married Walliamma, an adopted daughter a local Veddha chieftain here. Koneswaram, also spelt Koneshvaram, is the landmark temple of Trincomalee in north-eastern Sri Lanka. Koneswaram, beautifully situated on a promontory called Swami Rock, is said to have been built by Rishi Agastya on the instructions of Shiva, honouring his devotee Ravana, the King of Lanka. The historical temple building however was constructed during the era of the Tamil Pallava kingdom. It was destroyed by fanatic Portuguese Christians in 1624. Parts of the original temple are sunken in the ocean, making Trincomalee an interesting destination for scuba diving. Adjacent to the Koneswaram temple is another shrine, smaller in size, but of significance for Hindu pilgrims. It' s a reconstruction of the famous Shankaradevi temple at a new place. The original temple is believed to have been built by Ravana. It was ranked in the famous list of Ashta Dasha (18) Shakti Pitas inditedby Adi Shankara. The Ambasthala Seya, also called Ambatthala Chetiya in the sacred Pali language, is the main stupa in Mihintale, enshrining parts of the ashes of the monk Mahinda, who introduced Buddhism in Sri Lanka's Anuradhapura Kingdom. The Ambasthala Seya in front of the Aradhana Gala, the rock on which Mahinda arrived from India, is marking the place, where the missionary met the King of Sri Lanka for the first time, testing his intellect in order to be sure he is prepaired to learn more about Buddhism. Due to these events, that took place on a Poson Poya day (full moon in June), Mihintale is called the birthplace of Sinhalese Buddhism. 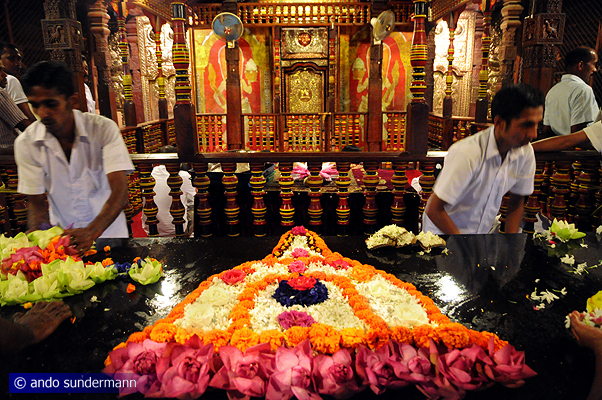 Besides Buddha's birthday at Vesak Poya (May) and the Esala Perahera festivals (in July/August), Poson Poya in Mihintale, commemorating those events that took place at the Ambasthala Seya, is the most important pilgrim festival in Sri Lanka. 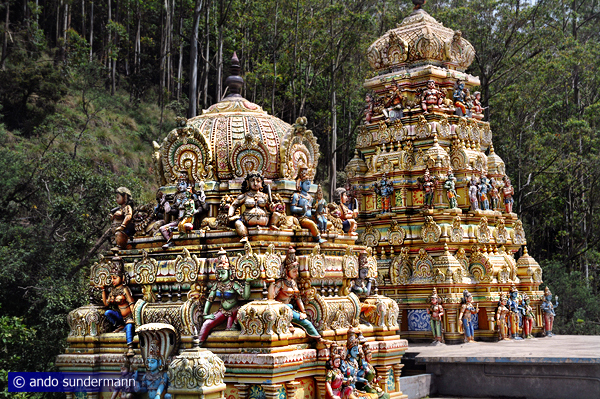 The Sita Amman Temple, located halfway between the highland village Sita Eliya and the Hakgala Botanical Gardens, was originally a typical Tamil Kovil of highland plantation workers. In recent years it has become the most venerated of all Ramayana Trail sites in Sri Lanka, because it is believed to be the place where Lord Rama's consort Sita spent most of the time during her captivity on the island of Lanka. After she refused to stay in the magnificent palace of Lanka's King Ravana, he transferred her to the grove or garden called Ashoka Vatika (or Ashoka Vana) where she lived under Ashoka trees. It was here that Ravana's wife Mandodari visited her and that Hanuman met her for the first time, identifying himself with the finger ring of Rama. Sita is said to have bathed in the nearby stream. There are remarkable holes in the rock surface at the river bank believed to be footprints left by Lord Hamunan.